The standard treatment of cancer patients has consisted of an approach involving some combination of surgery, chemotherapy and radiation. Admittedly, these methodologies have grown sophisticated over the years especially in the areas of surgery and radiation. However, chemotherapy is a “shotgun approach” employing powerful drugs that target any dividing cells. The nature of these drugs cause significant side-effects in the patients that they are administered to. There are a new family of drugs that have been developed to combat certain types of cancers that are more highly targeted. 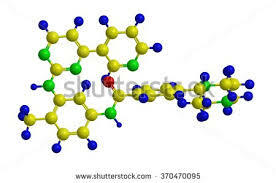 Among these are Imatinib Mesylate – Gleevic –(see illustration below). Gleevic has been used in the treatment of acute lymphoblastic leukemia (ALL) and gastrointestinal stromal tumor. 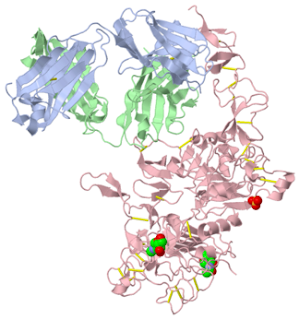 This drug specifically targets the enzyme tyrosine kinase that has been implicated in certain cancers. Another drug that has shown promise in trastuzmab – Herceptin (see illustration below). Herceptin has been used to treat patients with HER2+ breast cancer and adenocarcinoma of the stomach, for example. Herceptin is a monoclonal antibody (mAb) that targets the HER2 protein found on certain types of cancer cells. The new approach to fighting certain types of cancers involves a methodology referred to as adoptive cell transfer (ACT). ACT actually employs the patient’s own immune system in fighting the cancer cells. Impressive results using this methodology has been shown in clinical trials involving patients with advanced B-cell ALL. CD4 and CD8 lymphocytes are harvested from the patient’s blood. CD4 T-cells are so-called helper cells and the CD8 T-cells are the cytotoxic cells. These cells are genetically modified using an engineered retrovirus. 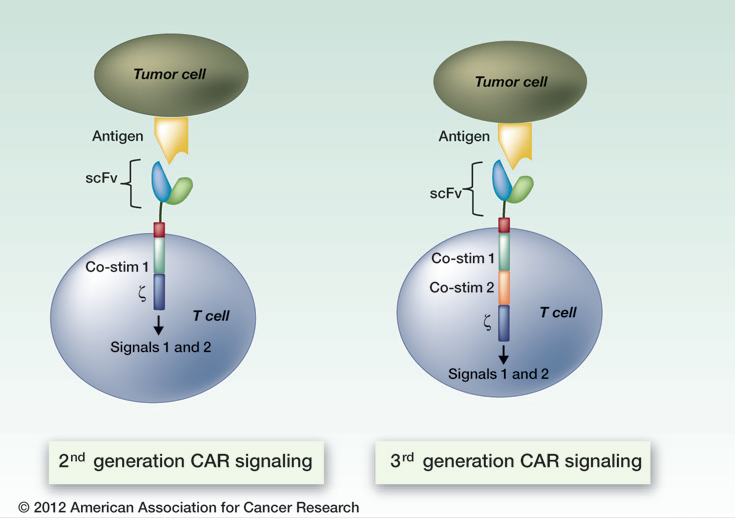 The genetic information that is introduced results in the production of a protein referred to as a chimeric antigen receptor (CAR) that binds to a specific cancer cell surface protein (see illustration below). Structurally, CARS are modified mAbs. In the case of ALL, the target protein is CD19. Once the patient’s CD4 and CD8 lymphocytes have been successfully modified in the laboratory, they are grown out into billions of cells. These are the cells that are reintroduced into the patient via infusion. There is one significant side effect from this approach; it is referred to as cytokine release syndrome that is a direct result of the modified T cells actively involved in killing their cancerous targets. However, this is a manageable condition. The results to date in clinical trials have been extraordinary. This methodology shows great promise that eventually may have broader applications in the treatment of cancer.